The "36-Hours of Florida" came to a close last night when the checkered flag flew at the Mobil 1 Twelve Hours of Sebring. With a promising start for the Porsche factory 911s, the team and fans alike were hopeful the damage done at the start of the season during the Rolex 24 Hours At Daytona could be undone. For the first 11 hours of the 12 hour race it looked like the problems of Daytona were safely in the rear-view. Then, it all fell apart in a way that only those familiar with endurance racing can understand. 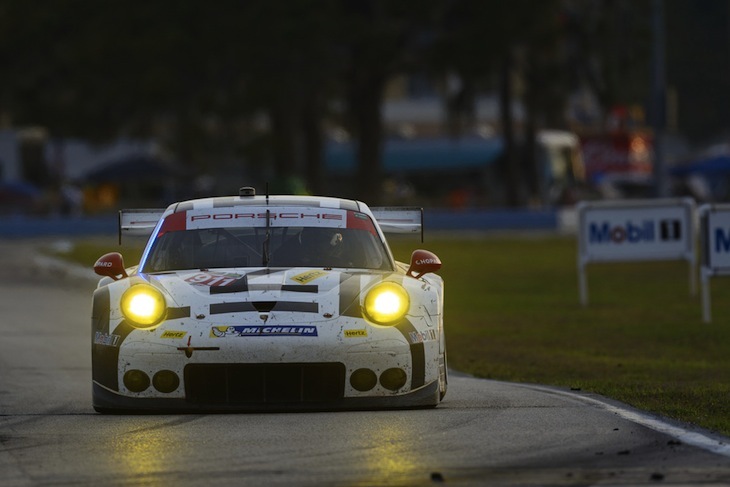 Fortunately, it wasn't all doom and gloom for Porsche and there were celebrations in both GTD and GTLM. More importantly, despite the final results, the factory platform, the 911 RSR, looked very competitive. 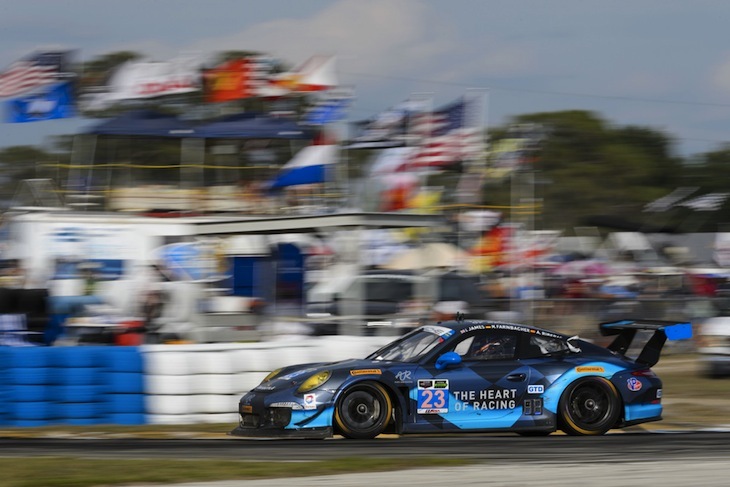 Read Porsche's full race report after the gallery for all the details. Both of Porsche's factory 911 RSRs ran near perfect races for the first 11 hours. With the No.911 and No.912 running 1-2 they commanded a large lead over 3rd place. Then, in a matter of minutes, it all fell apart. The No. 912 Porsche North America Porsche 911 RSR started the race in P1 and ran in the top 3 for most of the race. However, on their last pit stop, the crew was unable to remove the left rear-tire and had to send the car back around. After completing one more lap No.911 rumbled back in and the tire was successful changed. However, they were now two laps down. Shortly after rolling back onto the track the left rear tire could be seen trying to shake itself off. It was apparent that the wheel nut had failed, locking the wheel to the hub. After attempting to make repairs in the pits, Porsche moved No.912 back to the paddock to finish repairs. When they emerged, 30-minutes later, they had lost muliple positions and finished the race in seventh in GTLM. With the No. 912 out, it was up to the No. 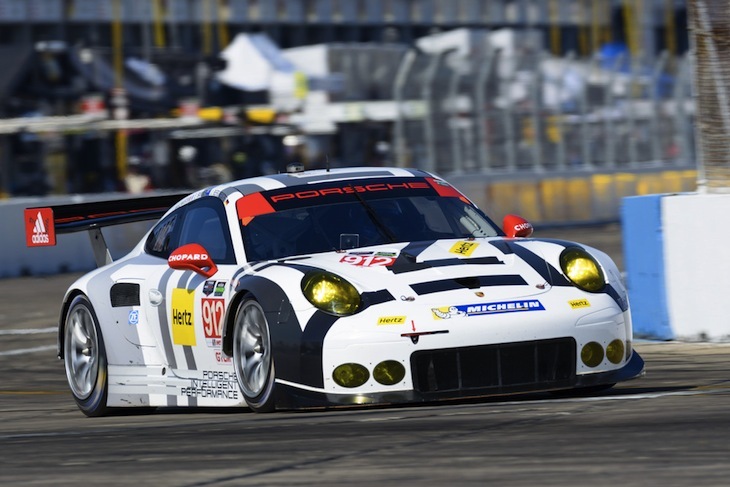 911 car to take things home for Porsche's factory team. However, within minutes, Porsche pilot was reporting shifting problems and the 911 began to slow. It was soon overtaken by the winning Corvette and Tandy finished the race in 5th place. 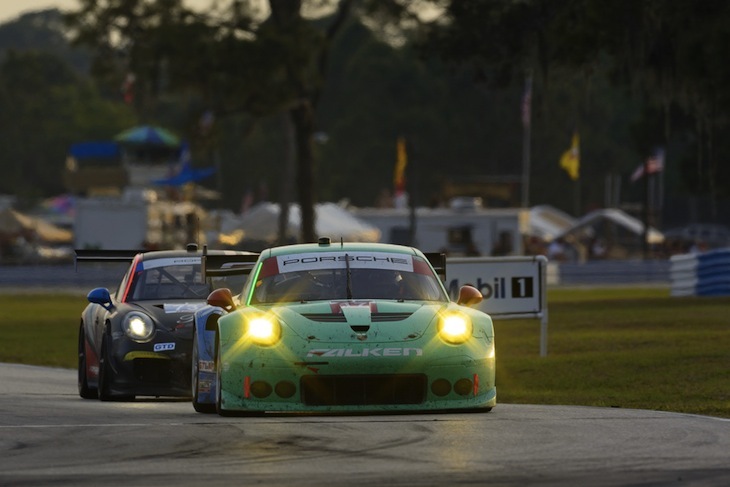 Alongside the two factory 911s, Team Falken Tire ran in one of the top five positions for most of the 12-hour race. When the two factory Porsche's fell behind, and the chance of a Porsche 1-2 finish (or perhaps a podium sweep) was lost, it was the No. 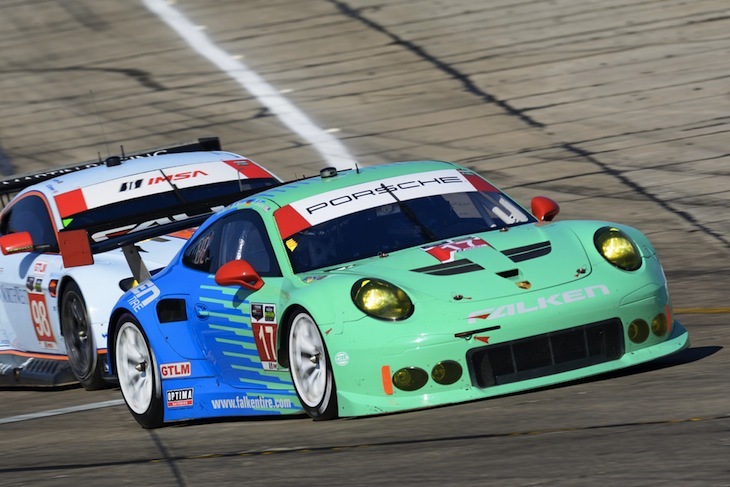 17 Team Falken Tire entry driven by Porsche works drivers Wolf Henzler and Patrick Long as well as Falken Tire factory driver Bryan Sellers who took the podium with a third-place finish in GTLM. 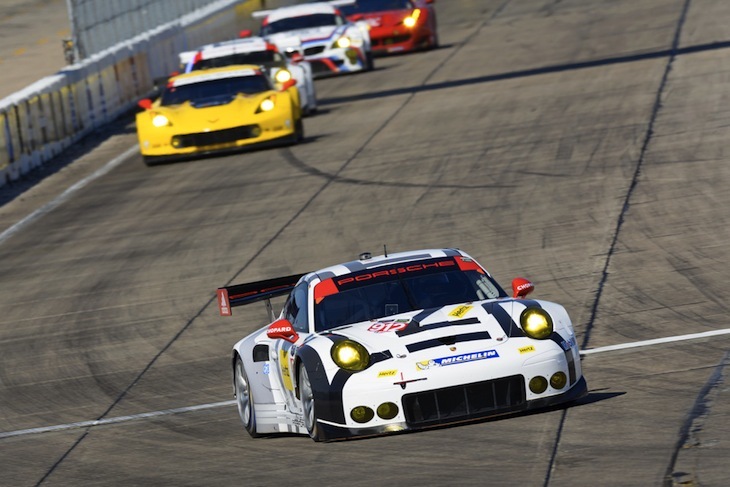 Like the faster GTLM class, the GT Daytona class has become a model of close competition. However, nowhere in the Pro-Am class’ history has proven to be more competitive than closing laps of today’s second round of the 2015 season. The battle throughout the day saw the Porsche 911 GT America challenge the Dodge Viper SRT for class superiority throughout the race. In the closing minutes of the 12-hour event, the No. 23 Team Seattle Alex Job Racing Porsche 911 GT America – shared by Ian James, Mario Farnbacher and Alex Riberas – led with ten-minutes remaining. Under heavy pressure from the Viper, Farnbacher went deep into Turn 10 and off the track. He returned undamaged but now in second-place. With four minutes left on the clock, the Viper rolled into pit lane without power and a blown engine. Farnbacher brought the No. 23 home with the win. Giving Porsche its 70th win. In 63 years of the 12 Hours of Sebring, Porsche has stood on the top step of the podium with class and overall victories 70 times. 10 of those class victories have Alex Job Racing pedigrees. Alex Job Racing has Sebring victories in 2015, 2013, 2012 (one-two in GTC class), 2010 (one-two-three in GTC), 2004, 2003, 2002, 2001, 1999 and 1995.